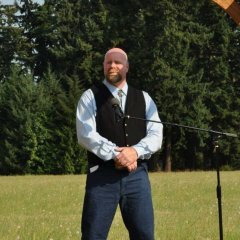 Howdy folks, Big John Dillon here. I'm new to SASS and CAS. I'm currently putting together the weapons I need to compete, and I have a question on long gun barrel length. What do you-all recommend for riffle and shot gun barrel lengths and why? I have all my weapons chosen, I just need info for lengths. Lots of lengths are used and work fine. But the top guys pretty much use 18"-20" rifles and 20" +/- on shotgun. Oh yeah, you asked why. Longer lengths don't swing as quickly and targets are close enough to not need the longer lengths. 20 inch on both. Lighter and handier going in windows, around props. Exactly as Abilene and Goody said. We are shooting "a drag race with firearms." Accuracy needed is a very small consideration. Reliability and quickness wins. Intuitive aiming, trigger it off as the sights get aligned on target. A long heavy barrel slows down the pointing, while trying to achieve accuracy. Ummm, "firearms. " We hope these guns don't have to be used in anger. Welcome and a big Minnie Pearl style HOWDEEE!!! Well shucks. Why all these real long barrel recommendations?? I like 16 1/2 inch rifles and 18 1/4 inch Shotguns. Oh, and 3 an a quarter inch handguns. Cap Guns. Snubbies ROCK!! For rifles, I have everything from 17.5" to 24" and I can honestly say that it doesn't really make much if any of a difference to me in my shooting as far as speed is concerned. 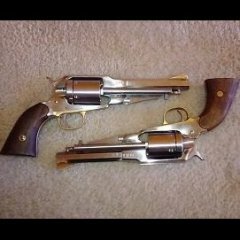 For shotguns on the other hand, and I am in the minority here, I really prefer a longer barrel. I started out the game with a 97 with a 20" no choke barrel. 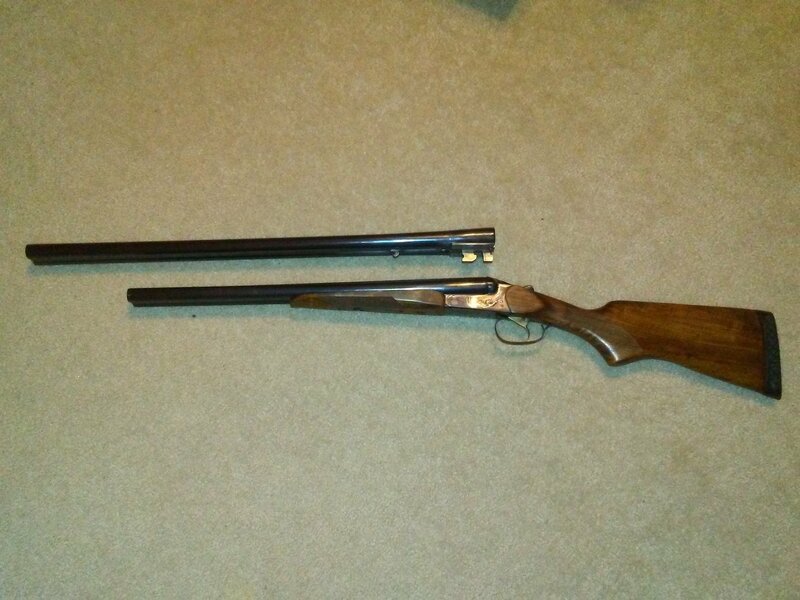 I wanted to get one with a long barrel, just to have one, and I eventually found a 30" full choke one. After using it only one time, it became my primary main match shotgun for the simple reason that I [almost] never miss with it. With the shorter tube, I would far too often fail to knock down the shotgun targets. With the long one, I pretty much hit 'em every time. I'm not sure why, but I think that the longer barrel makes me line up on the target more accurately or something like that. It does take a little bit of practice to get used to the longer shotgun barrel, especially when the stage props are tight, but you soon get used to it. It's also fun to laugh at all the funny looks you get for having such an out of the ordinary gun. I remember at EoT a coupla years ago how people would good naturedly chuckle at the way I had to maneuver the gun around the props when staging or heading over to the unloading table in ways that folks with shorter shotguns did not have to do. As far as what you should get, you have two options. 1. Try different guns and figure out what works best for you, and get one like that. 2. 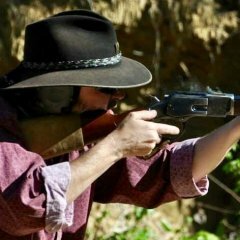 Get an eclectic mix of guns and barrel lengths and just shoot whatever hits your fancy for each particular match. That can be fun. My "primary" main match guns. Shot EoT clean with 'em. 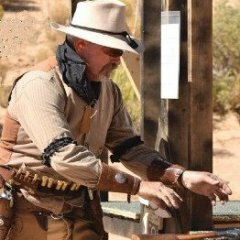 Interests:I love the history of the old west and shooting. Big John Dillon, Welcome to the best game and folks goin no matter what barrel length you choose! We're a SASS family. We have three 1873's ranging in length from 18 to 20 inches. As others have said the shorter barrels are easier to maneuver and there's no real need for longer barrels in this sport. We have four SKB 100s, all of them have 22 inch barrels. When you're picking a length for your shotgun barrels (assuming it's a double) be aware that the shorter the barrel the less weight you have out at the end to help get it open when you thumb the release. Yes you can slick them to just fall open, but slick them too far and they'll come open under recoil. 22 inches is a nice compromise IMHO. Shorter is generally better because you have to maneuver in and out of stages. But more important than that is what feels right to you. Too short or long of a barrel and the gun doesn't point or swing naturally. So my advice would be to find the shortest barrel you can that handles right for you. Hey, thanks everyone for the input. You all have been a great help and I now know the barrel lengths I'm going with. Going 20 on the rifle and 22 on the side by side. I hope you see you at some matches. Welcome! Good choices-your hat is more important than your guns-get a good one and break it in til it fits your head like it grew there. If you can't find what you want local, reach out to Blackwater over in the Saloon and have him build you one custom. He's reasonable and talented, but don't tell him I said that or his hat stretcher is gonna be occupied.